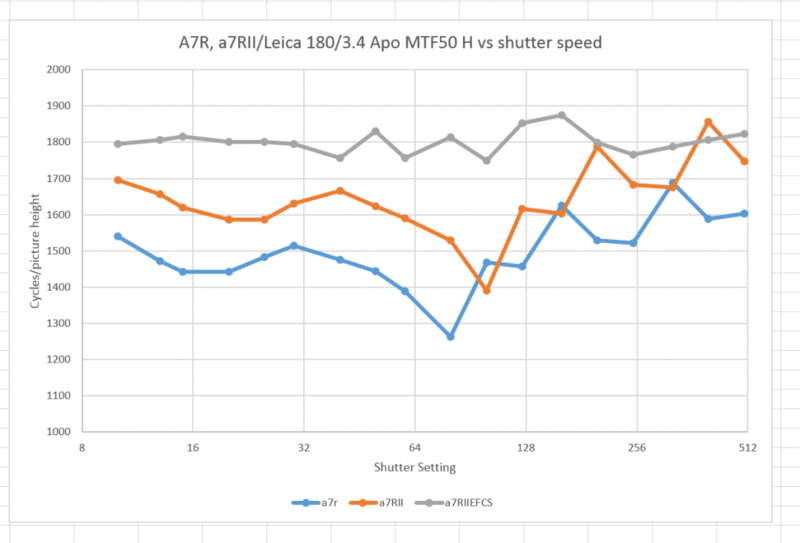 The mechanical shutter on the Sony a7RII is supposed to be better damped. It also has electronic first-curtain shutter (EFCS). How do those things make moderate telephoto pictures sharper? The cameras: the Sony a7RII and Sony a7R. The filter: Heliopan 77mm variable neutral density. The lighting: a single Fotodiox LED-200WA-56 daylight balanced flood. Manual focusing wide open, then lens set to f/5.6. Camera on an RRS TVC-43 with an Arca Swiss C1 head, RRS L brackets in landscape mode. Exposure protocol: ND filter to minimum attenuation,, shutter to 1/500, make an exposures, ND filter down a third of a stop, shutter down a third of a stop, make another exposures… until you get to 1/10 second. Make a series with both cameras, EFCS on and off in the case of the a7RII. Develop in Lightroom 5.7.1 with standard settings. Crop, export as TIFFs, analyze for horizontal edge (that’s the edge perpendicular to the way the shutter travels) MTF50 in Imatest. Export the results to Excel and graph. Landscape orientation makes it easier on the mechanical first curtain cases, since the tripod is stiffer in that orientation. Mounting the camera body directly to the tripod also makes it easier on those cases. The blue line is the a7R. It does the worst even at high shutter speeds by virtue of its slightly lower-resolution sensor. The orange line is the a7RII with both curtains operated by the mechanical shutter. I still exhibits shutter shock, which is not a surprise. The grey curve is the a7RII with EFCS on. It looks pretty darned good. That’s right. Thanks for commenting though, Jack. Always nice to hear from you. Hi, not about this, but just a hope that once you start testing the range finder lens compability, I’d wish you’d also compare curvature of field on both A7rII and A7(r) with some lenses with exist pupil close to the sensor. Coming up. I don’t expect corner smearing to change, since that’s a function of the sensor stack thickness, but I have hopes for lower corner color casting and “Italian flag” effects.